Breaching the world of RVing, especially for a first-timer, means taking a look at some important factors such as the price, weight, among others. While we have many other posts that cover the various classifications, the lightweight travel trailer category contains the perfect size camper for a small group of 4-5 people. Read on to discover the the 5 best bunkhouse travel trailers under 5,000 pounds! What puts an RV on the list: While a travel trailer with a bunkhouse floorplan is easy to find, the list boils down to a selective few when you consider the ones that are under 5,000 pounds GVWR. Even then, we’ve selected the ones with the best reviews, newest layouts and a good ratio of length to sleeping capacity to make your lightweight camper a spacious one too! 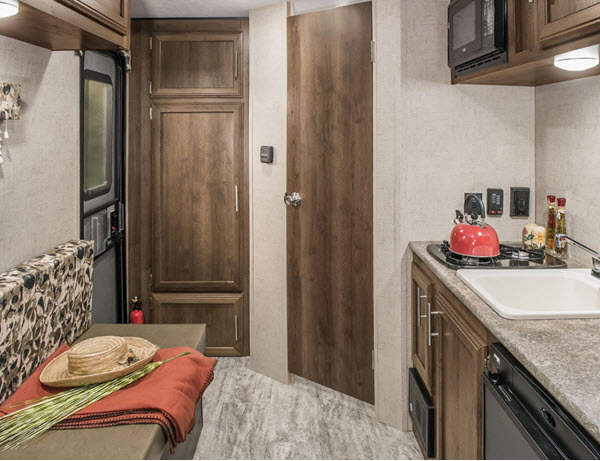 View All KZ Sportsmen Classic Travel Trailer Floorplans! Why we recommend the KZ Sportsmen Classic travel trailer: The sportsmen Classic has been one of our favorites. It has earned the top spot in both our top 5 list of the best travel trailers under 5,000 pounds as well as this one. 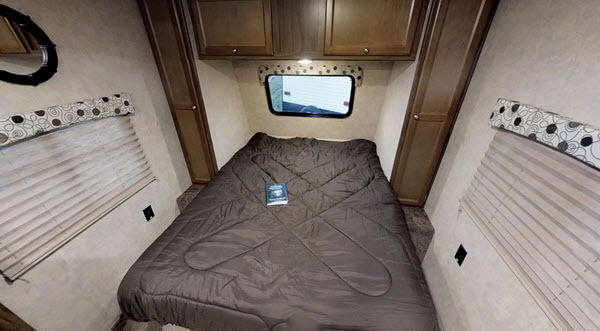 This is because its floorplans such as the Sportsmen Classic 150BH and the Sportsmen Classic 181BH provide a good amount of space as well as a sleeping capacity of 4 and 5. 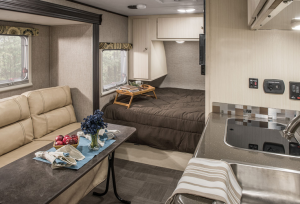 Of course, apart from having bunkhouse floorplans that are under 5,000 pounds GVWR (which is a feat in itself), it has a lot of the best-in-class features along with a few exclusives. These include the tough shield .30 exterior metal and front diamond plate on the outside and the tinted windows and a 20,000 BTU furnace on the inside. Those looking to amp up those stats will also find the Sportsmen Classic to their liking. 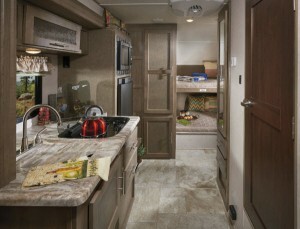 This upgraded version has options ranging from a U-shaped dinette to a 6.3 cubic feet refrigerator. 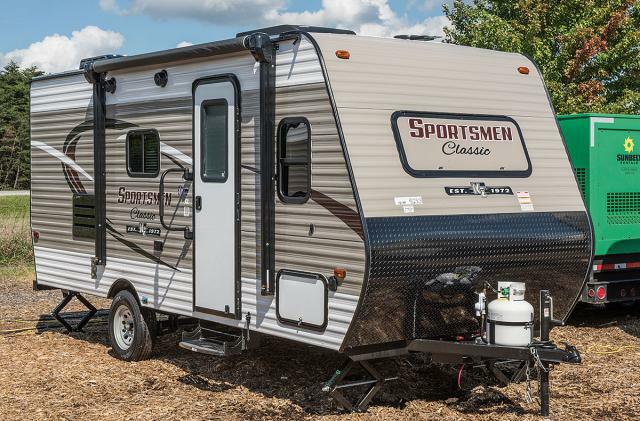 In a nutshell, the KZ Sportsmen Classic is definitely one of the best bunkhouse travel trailers under 5,000 pounds! 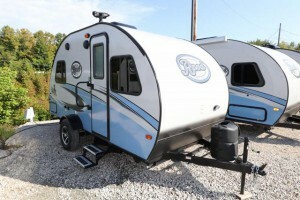 View All Forest River R-Pod Travel Trailer Floorplans! Why we recommend Forest River R-Pod travel trailer: Forest River is a company well known for making a variety of different travel trailers for different uses. The R-Pod is no different, with a lot of its floorplans being under 5,000 pounds gross weight and 3 of them having the bunkhouse floorplans. Even these floorplans are slightly different from each other such as the R-Pod RP172 with it’s sleeping capacity of 4 people and the R-Pod 182G with it’s 20-feet long footprint! Don’t let it’s small size fool you, however. The company has managed to add enough features to make it a decent camper and also one of the best bunkhouse travel trailers under 5,000 pounds. 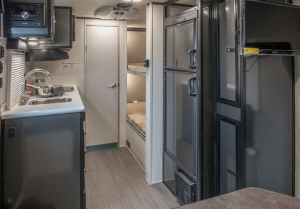 For example, you won’t find a lot of travel trailers of this size that feature a 20,000 BTU furnace, a 3-way refrigerator and a 2-burner cooktop. Apart from that, you can also increase its capabilities or add new features later down the line with its slew of options available. The list is quite long so we suggest clicking on the link above the description to find out all about it! 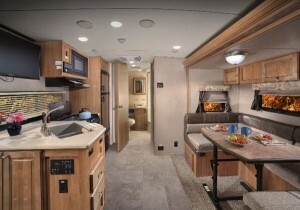 View All Coachmen Clipper Ultra-Lite Travel Trailer Floorplans! 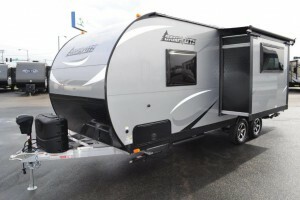 Why we recommend the Coachmen Clipper Ultra-Lite travel trailer: As the name suggests, the Clipper Ultra-Lite is one of the travel trailers you can tow rather easily. 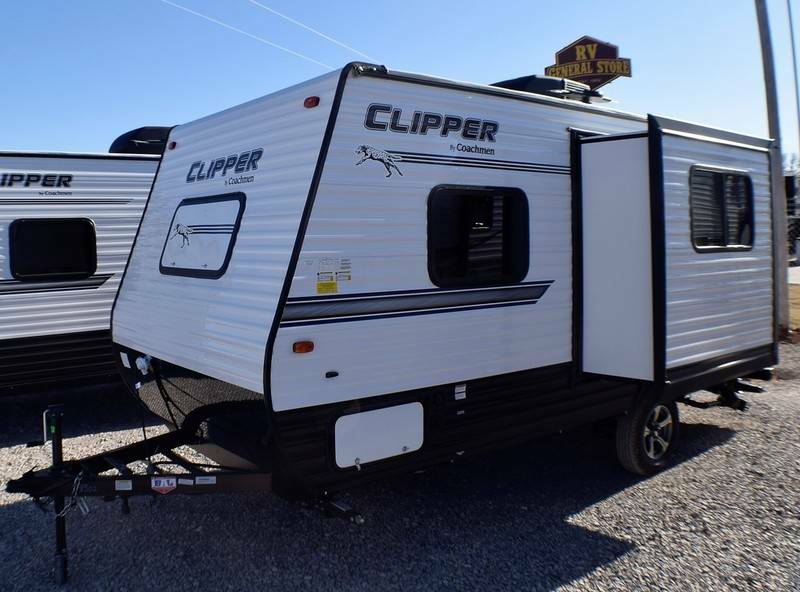 Even more so when you consider that its Clipper Ultra-Lite 17BH and the Clipper Ultra-Lite 17BHS are only ~2300-2600 pounds heavy in dry weight, and for bunkhouse floorplans that is quite good. Of course, if you’re willing to extend that range a bit further you also get floorplans that are more spacious and offer better sleeping capacities. Since we’re talking about the ones that are under $10,000 in particular, we’ll focus on the features of the 1700BH. It shares the same aerodynamic profile as the other floorplans. Head on inside and they have bunk beds and a queen bed that can hold a total of 5 people. 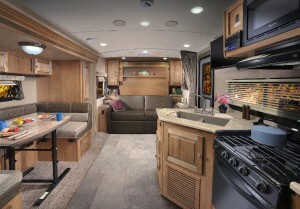 The 21.5-feet footprint, makes it a spacious without sacrificing any options. The shower/tub combo in the bathroom saves space while managing to provide you with both of the features. To top it all off, it has a 6-cubic foot size refrigerator, something quite lacking in travel trailers which are around 20 feet in length. Why we recommend the Livin Lite Camplite travel trailer: Named aptly like the rest of the travel trailers with the word ‘lite’ in them, the Camplite by Livin Lite is the only travel trailer in the manufacturer’s stables, but is a impressive one as well. 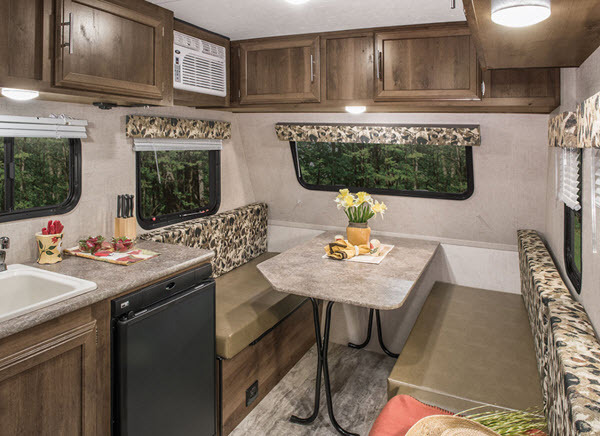 Apart from under 5,000 pounds floorplan, the Camplite CL16BHB, it also has many other sub-5000 pounds GVWR floorplans such as the Camplite CL16DBS that offer other features and more space since they don’t have any bunkhouses. Taking a look at the features you’ll notice that there won’t be much of a difference between this and a regular-sized travel trailer, if at all. Some examples include but are not limited to its full-sized 6 cubic feet refrigerator and the topper awning. 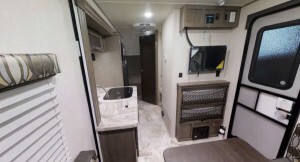 Of course, that’s not the end of it and apart from its large list of features you can add a few more with the available options such as a rear and sidebox awning, compliance with Canadian RV Standards, and even a 11,000 BTU Air Conditioner. Why we recommend Forest River Flagstaff Micro-Lite Travel Trailer trailer: It shouldn’t come off as a surprise that the Flagstaff Micro-Lite is not only one of the best campers, but also also one of the best bunkhouse travel trailers under 5,000 pounds GVWR. 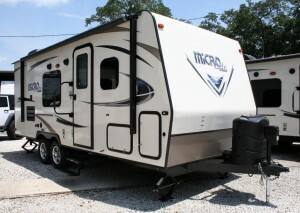 After all, not many travel trailers can claim a ~4.5 star rating (based on an average of rvt.com and our website) and have a bunkhouse floorplan under 5,000 pounds such as the Flagstaff Micro-Lite 19FD. Of course, something like the Flagstaff Micro-Lite 21DS is also a great choice if your towing vehicle can handle a bit more than that. The power vent fan are for its 14RK and 17RK floorplans only, and there are 2 frame mounted stabilizer jacks instead of 4 on the 12RK. 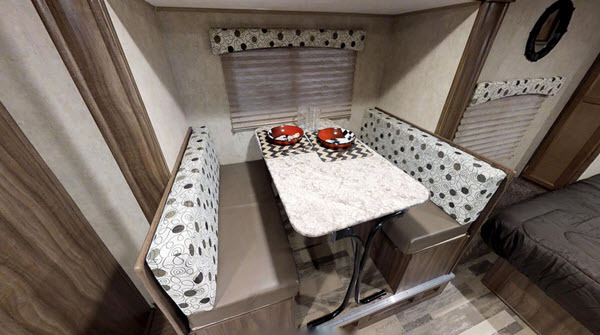 Regardless, they are overall quite impressive, and if you wish for more, then there are lots of options which will add new features and upgrade existing ones so you have a quality travel trailer the next you head out to camp! Getting an easily towable travel trailer shouldn’t amount to compromises on the durability, sleeping capacity and features. With our top 5 list right here, it won’t come to that! 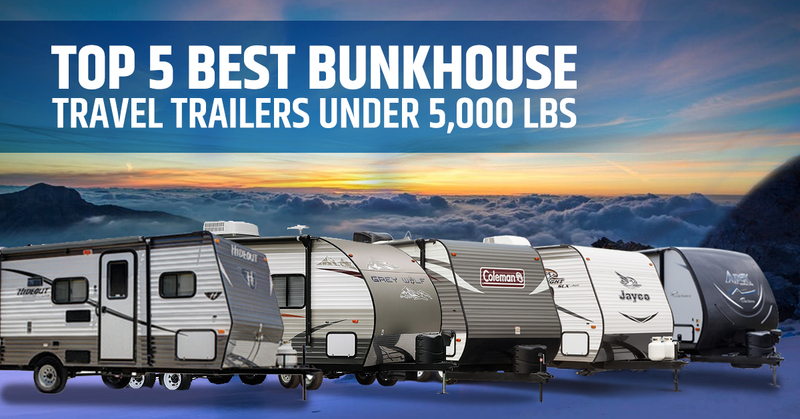 Share with us your favorite bunkhouse travel trailers under 5,000 pounds in the comments below!